Enjoy miles of white sand beaches in sunny Florida! Everybody needs a place to get away. If you like walking on sandy beaches and escaping from hectic everyday life with a promise of adventure, excitement, and discovery, then Bonita Beach and Tennis Club is the answer! The club consists of ten tennis courts, two pools, a party room, hair salon, shuffleboard, along with many other fun and relaxing activities. The complex is located extremely close to Bonita Beach. All you have to do is cross one street and you have access to a beautiful relaxing beach. If you do not feel like relaxing at the beach, there are other activities available to do such as jetskiing or parasailing. While you're at the beach enjoy breakfast, lunch, dinner, or a breathtaking sunset at Doc's Beach House. If you have any further questions, please ask them in your inquiry. * 2 queen beds (linens provided) * Full bathroom * Fully furnished living room * Outdoor patio furniture * Great view of the Gulf of Mexico * Air-condition Kitchen * Full kitchen * Refrigerator * Cooking/Eating utensils * Microwave * Grill (located outside of the complex near the tennis courts) Entertainment * Cable TV * VCR/DVD/CD player * Flat screen TV * Telephone Suitability * No pets * Not suitable for children * Minimum age limit (please include your age in inquiry) * No smoking If you have any questions about amenities, please ask in your inquiry. This is my second year staying at the condo. The condo is well-stocked and includes many fun beach items. There is a great view of the gulf from the screened porch and the location is great for getting around the area. Tanya is very responsive to any concerns and I’m back in 2020! Great location & space with easy beach access. Close to restaurants and shopping as well. We spent a week here and enjoyed long walks on and off the beach, shopping close by, and we were able to walk to restaurants. 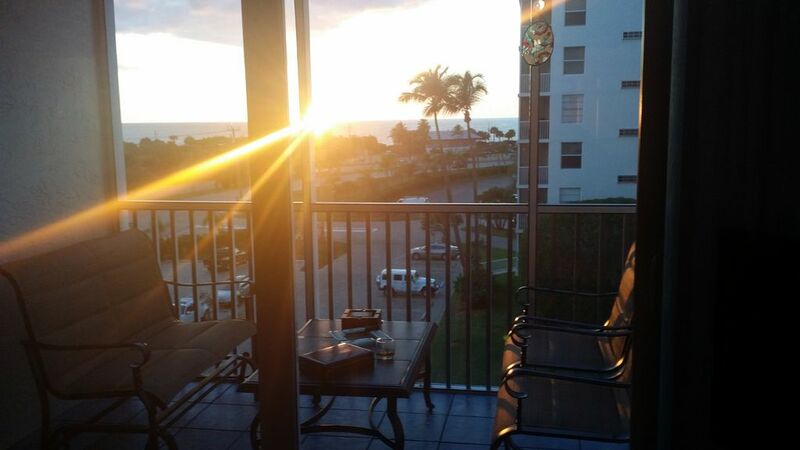 Our condo had a screened porch with a view of the gulf and the coveted sunset. We enjoyed a very good breakfast at the on site cafe. The condo space was nicely furnished and comfortable. The kitchen area is small but functional and well stocked. We were able to prepare multiple meals. The beds were comfortable, although because there were 2 queens in the bedroom space, it was tight. My biggest complaint is the bathroom. It was very old, outdated and did not appear to have been cleaned very well before our stay. All in all we really enjoyed our stay and would easily stay there again. Lots of thoughtful touches such as beach chairs, an umbrella, a cooler, even beach towels. Beds comfortable with LOTS of pillows. View of the gulf from balcony. Beach is across the road from complex so it's convenient. One thing that would make going to the beach easier would be a beach cart to put everything in so don't have to carry everything. It was a very peaceful place to stay. I enjoyed the quiet. Extremely clean and tidy. Nice little apartment at a perfect location, beach is right across the street. The place is a bit worn down (bathroom) but it suited us just fine anyway. Definitely recommend the place! Great place with a view of the ocean. My husband and I stayed a week and enjoyed all the amenities provided. We managed to play tennis on 3 different days on the wonderful clay courts. We ate the Cafe on site several mornings. It was great to walk over and have a breakfast at a low price and great tasting food. The convenience of the beach was only a short walk across the street as is Doc's, our favorite bar and restaurant right on the beach. Everything was so handy and we hope to come back next year. The condo is small but perfect for just the two of us. * Close drive to Naples and Fort Myers. * Close drive to Coconut Grove outdoor shopping mall. If you have any questions about nearby attractions or activites, please include it in your inquiry.